Happy Friday and a very happy Children's day !! ...thus dinner these days is usually quick and simple.. wrapped up almost always with a helping of yogurt for dessert. Weekends are however different. We are all relaxed and while the boys hang out doing boy-stuff... I take my time and prepare something special for them. 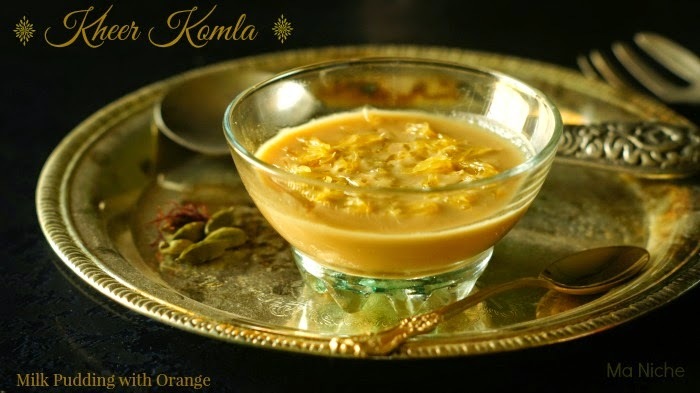 Literally, Kheer Komla means milk pudding with orange. In winter when the local markets flood with oranges almost every Bengali I know picks up a bunch and prepares bowls of Kheer Komla. Of course those who have the luxury of time, patiently watch over a kadai of whole milk while it simmers and reduces to kheer, then sweeten the reduced milk, flavor it with elaichi(green cardamom) and sometimes saffron, chill the kheer, then dot it with segments of oranges... 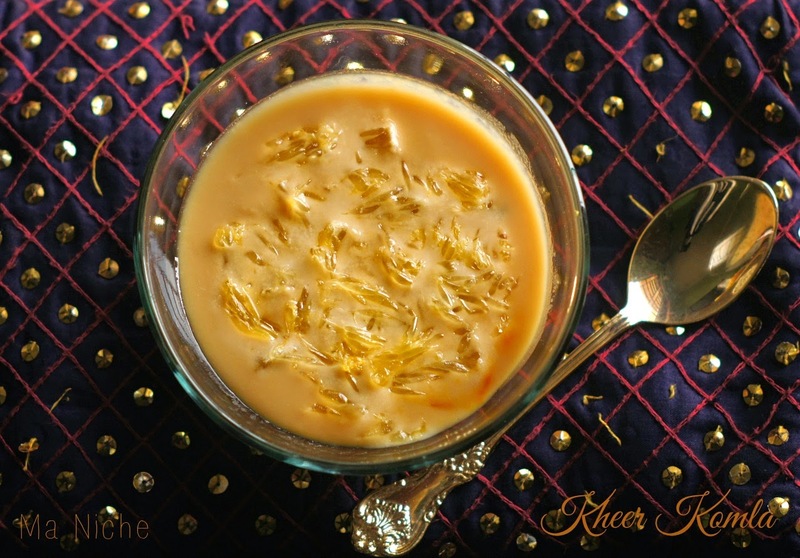 While others like me take the short route and prepare the kheer with a mix of whole milk and condensed milk and then flavor it and adorn it the usual way. In a large saucepan or kadai, combine 2 cups of milk with the sugar and salt and bring to a boil over medium heat. Reduce the heat to medium-low,split open the green cardamom, add it to the milk and stirring occasionally simmer the milk for 10 minutes. Meanwhile stir the saffron into the remaining milk and keep it aside. Once the milk in the saucepan thickens and becomes a light shade of orange , add the remaining milk to it and stir occasionally simmer over medium-low heat for another 15-20 minutes until the flavored milk thickens enough to coat the back of your spoon. Now switching off the heat, pour the flavored milk into 2 or 3 serving bowls and chill for 1 hour. Add the orange segments to the bowl and chill the dessert for another hour or until you are ready to serve. Thanks Joy. You can actually use cardamom powder too. 1/8-1/4 tsp of cardamom powder is enough for the quantity of kheer I have cooked. Ohh kheer komola. how it screams winter in my part of the world...love your presentation. and your recipe is very unique. never used soda while making kheer. is it for colour? 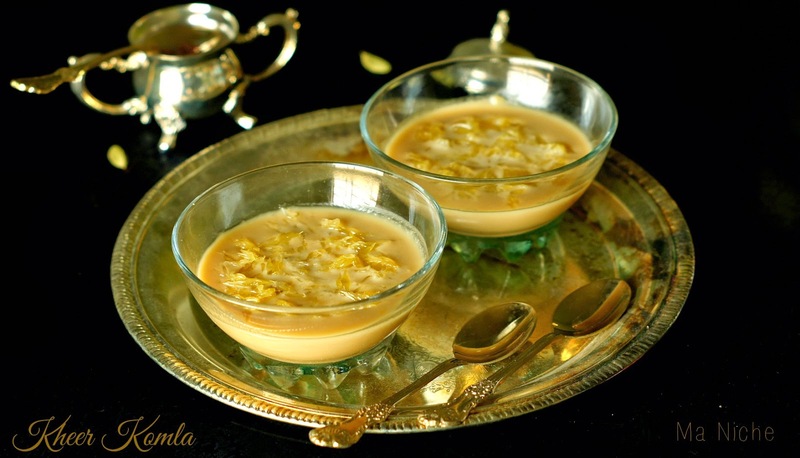 I'm always looking for a new recipe and your kheer komla is one of those. It looks delicious. Your pudding looks delicious! Thanks so much for sharing your awesome post with Full Plate Thursday and hope you are having a great day! I've missed your wonderful recipes. It does sound like life has gotten very busy for you. Pinned this great recipe. Thanks for bringing this by Weekend Bites. congrats on your new job. 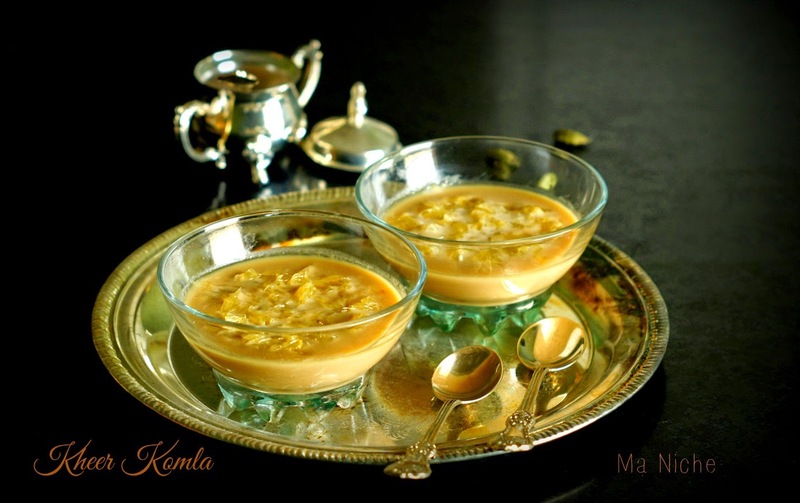 kheer, looks delicious thanks for sharing with Hearth and soul blog hop and pinning. I've never heard of this dessert before, thank you to introducing me to a new dish. Thanks for linking up to Sweet and Savoury Sunday, stop by and link up again. Have a great day! !